Starting a small scale business requires lot of planning and the willingness to start such business depends on the available small business ideas and business plans. Most small businesses require little capital to start and just in case the business did not do well, the loss of capital and the business may not be too painful, that is why you need small business ideas before you start a business in the year 2015. 1. Online business : This involves working and making money through the internet which include online Article writing, Adsense, Affiliate marketing, blogging, virtual assistant, Sport betting, translator, copy writer, online selling, data entry jobs, micro jobs etc. Online business is good for anyone who want to start a small business and do not have much capital but have good phone/computer with an internet connected devices. Some internet business are simple e.g data entry jobs and taking paid survey which pays as high as in $5 - $20 per hour. 3. Make-up artist/hair salon: Small Businesses like makeup artist or hair salon is a good small business idea for anybody to start. Makeup artists services are in high demand every where especially in the fashion and entertainment industry. If you have or learn't a makeup skills and talent then, you can start your own makeup business even on a large scale. When a makeup artist provides good service for customers, its possible such person get long-term contracts which brings good income. And for salon, i don't think women and men can do without going to the salon weekly irrespective of the area. 4. Cleaning services: Cleaning service is a profitable business idea for any person who loves business. Cleaning apartments, homes and commercial establishments. cleaning service can be a good business idea with reasonable source of income. 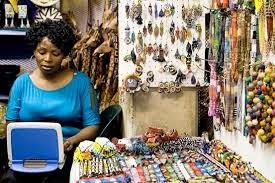 This business can be done on a small scale and later get upgraded.You could watch people's cloth, cars, homes, rugs etc for money. 5.Baby sitting : Baby sitting is a kind of business that needs no license but to take care of kids while you also take care of your own kids too. The population of babies is increasing and working mother needs baby sitters to help them out and get paid for the services rendered while in their homes. 6. Waste Recycling : Waste recycling is a business in which the recyclers earns and also takes care of the environment by helping to keep a clean environment. A pickup truck is all what is needed to start and can be used to pick all scrap plastics, scrapped metal, used books, toiletries, computers, electronics, waste food items etc. 7.Party planner : Party planners can be a nice small business option for the year 2015. If you can help people organize their parties, birthdays, weddings etc then you re in for a good business. Party planning business only requires some amount of creativity, neatness, patience and ability to provide a good job done for people when they need the services. 8. Pet Services: This business is common in America, Europe, Asia and some part of South America where pet sitters help the owners feed, car and pamper their pest e.g dogs to get paid. These are lucrative small business that can be done in the year 2015 which i believe guarantees good income and cost little to start. Thanks for reading.